When, back in November 2003, we started our T2M adventure, a clear goal was formulated: we wished to create a solid, international platform of intellectual exchange and, in parallel, renovate the field by bringing in new topics and approaches. Now, after two-and-a-half years, we have accomplished a lot of things that have substantially brought that overall goal nearer. We have an Association with 134 members from 23 countries (of which nearly one third are PhD students); we started a very successful series of annual conferences with their own character (with emphasis on debate rather than reading papers) and with nearly 125 papers (many of them not submitted by members, so we’re still growing); we have an affiliated scholarly journal open to the very best of our members’ intellectual products; and we have an organizational structure in the making, which is already able to put all these things in motion, although we are still staring very much at our own navels (as we say in the Netherlands) and T2M doesn’t seem ready yet to embark on new projects. 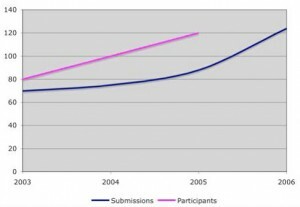 Overview submitted proposals and partipation numbers previous T2M conferences. It is no exaggeration to say that we have successfully ridden the growing wave of scholarly interest in matters related to mobility and transport history, and effectively managed to influence the direction in which this wave is rolling. 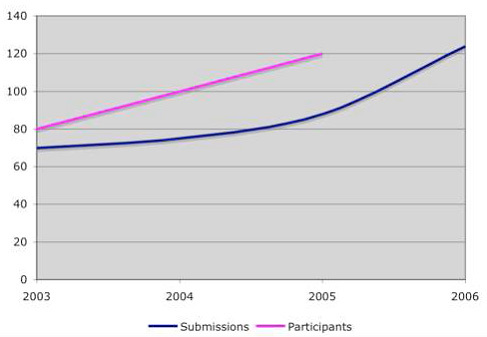 We have initiated several debates (among others, our relation to cultural studies, tourism history, and current planning and policy issues) and the resonance of our activities in adjacent fields (expressed by conference reports in Technology and Culture, or the presence of well know tourism historians in our discussions) indicates that T2M is making a difference. And yet, we are still far from a stable situation, both in terms of organization and finance. Several of our activities are still not routine enough to set free our energies for the essential issues we all care about: too often we still seem to be reinventing the wheel when we organize our annual conference, for instance, and we messed up the ballot for our EC last year. I hope the Statutes and Internal Regulations that the Executive Committee has been working so hard on during the previous years, and which we will bring to the members’ vote during the coming months, will provide a stable framework. This should enable us to concentrate on those issues that are so important for the renovation of our field: bringing in new members from adjacent fields (cultural historians; tourism history; planning and policy; the museum world) and embarking on new, challenging projects, such as the Theme Groups initiated by junior scholars within our midst, a summer school for PhD students, and maybe even our own book series. The ultimate goal is, of course, to open up academia for positions, projects and professorships dedicated to ‘new transport history’ to be taken up and run by our promising young members. And in order to do that, we need more organizational momentum: my ultimate goal is still to have a stabilized, structural membership of 200 – 300 within a year or two. I even think it would be possible to grow to a thousand members, but that is for a new president to try. My main concern at the moment is our financial situation. It has been improved considerably during the previous year: we have a nice, albeit still too-modest conference travel fund; we have a series of Awards financed by our sponsors; and our financial position considerably improved through the generous donation from York organizer Colin Divall of the positive returns of his conference. But structurally, we still have a long journey to accomplish: we need to have a solid financial foundation for our Secretariat (still kept in the air mainly by the generous support of the ECMD in Eindhoven) and we need to have funds for a further professionalition of our Executive Committee, enabling us to spend some money if we wish to embark on new activities. As I said before at this place: because we do not own our journal, we have to find other ways to increase our annual income. I am very pleased that during our EC meeting in Leuven, Belgium, last month, we installed a new subcommittee dedicated to sponsorship and institutional membership. I hope we will all put in some extra effort during the coming months to find sponsors and institutional members. It may sound odd, but the moment the EC can decide to have a professional designer develop our logo, I will be satisfied, convinced that we have left the adventurous but treacherous waters of organizational amateurism behind us. In the meantime I rejoice in seeing our fourth international conference nearing, with a record number of papers, put up by an enthusiastic young bunch of local organizers (led by Mathieu Flonneau and Vincent Guigueno). I must confess that I had my doubts about the attractiveness of the conference theme (Safety and Sustainability) but the surprisingly large response, both from inside and outside France, has proven me wrong. I hope to greet you all in Paris, after a safe (and probably not so sustainable) journey.